The Xerox DC1010s brings together an exciting combination of 'next generation' features to enhance the efficiency of in-office document production. 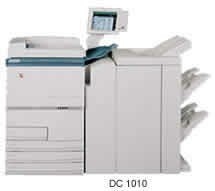 Offering reliability and speed, the DC1010s saves you time and money and is easy to use with an outstanding output of 101 pages per minute, together with a Colour Scanner. Complex documents can be designed, programmed and printed from your desktop making the outsourcing of print jobs a cost of the past. Using the DC1010S Scanner, full colour documents and images can be scanned, at up to 400dpi, and saved as industry standard TIFF files on the DC1010S Server. These files can then be downloaded using FTP or via an Internet browser for use on-demand. With up to 30GB of storage capacity, the powerful DC1010S Copy Server can file and save large volumes of scanned documents for on-demand printing. Up to 3000 pages, or 120 documents, can be stored along with the individual programming for each job, such as stapling, collating, hole-punching and/or duplexing. Alleviate the need to store hardcopy originals. The DC1010S Copy Server can also merge saved files, insert separators and add covers making the creation of complex documents simple. Saved files can be easily retrieved and reproduced, as required, via the user-friendly graphical interface. With six paper-feeder trays, the DC1010S accommodates up to 6870 sheets of paper to support high volume printing with ease. The Interposer can add covers, tabs, pre-printed materials and coloured separators to give complex documents that professional look. The Programmed Scan Ahead function enables users to scan and program new jobs (up to ten consecutive jobs with a total of 1000 pages) whilst the DC1010S is printing another job. The days of manual collation are over. The Build Job function allows a number of different documents to be combined and processed as one job. Using this function, final documents can be stored on the DC1010S Copy Server, along with their individual specifications including covers and separators, for future re-runs. The DC1010S Printer Controller has a number of unique features, including web functionality, LCD viewing and access to DocBuilder™Pro™ software. Using the Fiery® DocBuilder™Pro™ document imposition software, entire documents can be previewed, edited and assembled prior to RIPing or processing.